Passion fruits are one of my favorite fruits (although I admit that I do have a lot of favorite fruit!) 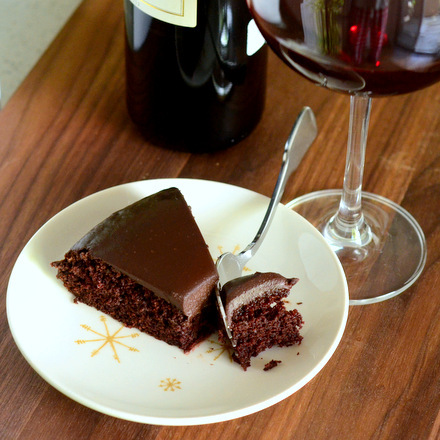 because its unique sweet-tart, floral flavor really captures the essence of the tropics. The fruit is actually a type of berry and it thrives in temperate climates. While it is associated with the tropics and thrives in temperate climates, there are quite a few varieties of passion fruit out there and they grow in many countries around the world including (but not limited to) Australia, Brazil. Mexico, India, tropical and subtropical Africa and the US. Each passion fruit is filled with juicy pulp and lots of seeds. The seeds are typically eaten along with the pulp of the fruit, but when you are going to use that pulp in a baking recipe or a cocktail, you may want to take them out and use the pulp – also described as the juice – of the fruit alone. Fortunately, juicing a passion fruit is relatively straightforward. 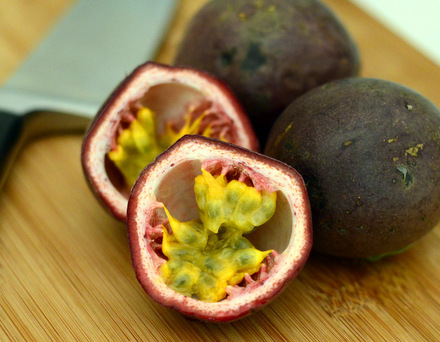 Take your ripe passion fruit (the skin should be slightly wrinkly) and cut it open. 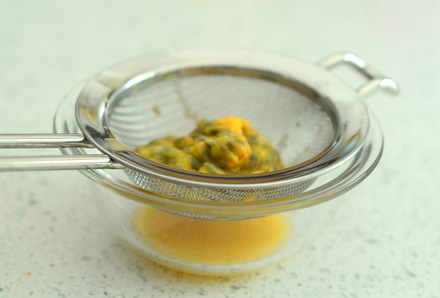 Using a spoon, scoop the pulp out into a mesh strainer. Use the back of the spoon to press the pulp through the strainer, leaving the seeds behind. Some pulp may stick to the seeds, but you’ll be able to get most of it off. I typically save the seeds when I juice passion fruits. 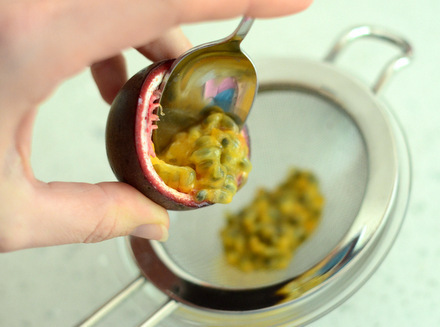 Adding a few seeds back to a dish that contains passion fruit gives the finished dish an attractive look and reminds anyone eating it that you used fresh passion fruit to make it. A great example of this is my Passion Fruit Curd, a wonderfully tropical twist on lemon curd.